315 Marlborough is located on the north side of Marlborough, between Fairfield and Gloucester, with 313 Marlborough to the east and 317 Marlborough to the west. 315 Marlborough was built in 1877-1878 by builder Daniel Weeks Beckler, one of four contiguous houses (309-311-313-315 Marlborough) built at the same time. Click here for an index to the deeds for 315 Marlborough. On April 24, 1878, while the houses were still being built, 315 Marlborough was purchased from Harvey Jewell by Joseph F. Paul, a lumber dealer. He and his wife, Rachel (Bicknell) Paul, lived at 588 Tremont. On February 2, 1880, 315 Marlborough was purchased from Joseph Paul by Mary Laile (Fanning) Bishop, the wife of wholesale leather merchant Charles J. Bishop, Jr. They previously had lived at the Hotel Huntington (Huntington at Blagden). They continued to live at 315 Marlborough until about 1885, when they moved to Jamaica Plain. On March 26, 1885, 315 Marlborough was purchased from the Bishops by Miss Emma D. Thomas. Her mother, Hannah Dane (Rogers) Thomas, widow of John Briggs Thomas, and her brother, John Babson Thomas, lived with her. Emma Thomas and her mother previously had lived in Cambridge. John Thomas had gone west in the mid-1860s. He became a surveyor and later manager of the Suffolk Cattle Company in Cheyenne, Wyoming (a company largely financed by Boston investors). He lived in Cheyenne until the mid-1880s, when he returned to Boston. In November of 1887, he married Frances Sistare Gookin. After their marriage, they returned to Cheyenne, where she died in childbirth in February of 1891. By 1894, he had returned to Boston with their infant daughter, Kathleen Sistare Thomas, and lived in Lexington. He became a real estate dealer in Boston. In June of 1908, he married again, to Marietta (Shea) Reece, widow of John Reece. After their marriage, they lived at 315 Commonwealth. Hannah and Emma Thomas continued to live at 315 Marlborough during the 1890-1891 winter season, after which Hannah Thomas (and probably Emma Thomas) moved to The Tudor (northwest corner of Beacon and Joy). On May 16, 1891, Emma Thomas transferred 315 Marlborough to John Thomas, who was living in Cheyenne at that time. By the 1891-1892 winter season, 315 Marlborough was the home of wool broker John Hurd Hutchins and his wife, Olivia Lee (Endicott) Hutchins. They had married in November of 1890. Prior to their marriage, he had lived at 240 Marlborough with his mother, Julia Hannah (Hurd) Hutchins, the widow of Horace Green Hutchins. John and Olivia Hutchins continued to live at 315 Marlborough during the 1895-1896 winter season, but moved soon thereafter to 222 Beacon. 315 Marlborough was not listed in the 1897 Blue Book. On July 13, 1896, 315 Marlborough was acquired from John Thomas by Dr. John Homans, II, a physician, who lived there with his mother, Eliza Lee (Lothrop) Homans, the widow of Dr. Charles Dudley Homans. They previously had lived at 184 Marlborough. John Homans died in May of 1902 and Eliza Homans moved soon thereafter to The Ludlow (southwest corner of Clarendon and St. James). On August 25, 1902, 315 Marlborough was acquired from John Homans’s estate by Dr. Lincoln Davis, a physician and surgeon. He previously had lived at 24 Marlborough. In October of 1902 he married Katharine Bradlee Crowninshield and they made 315 Marlborough their home. In July of 1903, he applied for (and subsequently received) permission to construct a 13 foot by 11 foot, one story addition at the rear of the property for storage. They continued to live there in 1907, but had moved to 217 Beacon by 1908. On September 12, 1907, 315 Marlborough was acquired from Lincoln Davis by Dr. Francis Charles Murphy, a physician. He and his wife, Anne M. (Scott) Murphy, made it their home. They previously had lived at 435 Beacon. Francis Murphy died in November of 1919. Anne Murphy continued to live at 315 Marlborough until about 1924. On June 27, 1924, 315 Marlborough was purchased from Anne Murphy and her daughter, Annette Scott Murphy, by Dr. Thomas Chittenden Hill, Jr., and his wife, Marion Lovett (Whitin) Brewer Hill. They had recently married and 315 Marlborough probably was their first home together. Cyrus Brewer, Jr., one of Marion Hill’s two sons by her former marriage, lived with them. They also maintained a home at Eastern Point in Gloucester. T. Chittenden Hill was a physician and proctologist. He maintained his medical office at 315 Marlborough. In the early 1920s, prior to her marriage to Dr. Hill, Marion Brewer had been president of Wells Brewer, Inc., a children’s wear company. They continued to live at 315 Marlborough until early 1930, but at the time of the 1930 US Census they were living at the Hotel Somerset. 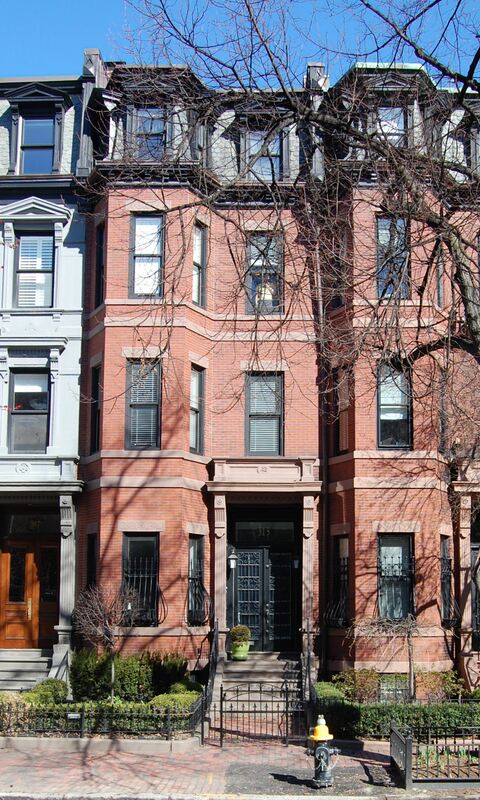 By 1931, the Hills and Cyrus Brewer were once again living at 315 Marlborough. They continued to live there during the 1931-1932 winter season, after which they made their home in Gloucester and he moved his office to 270 Commonwealth. They continued to own 315 Marlborough. 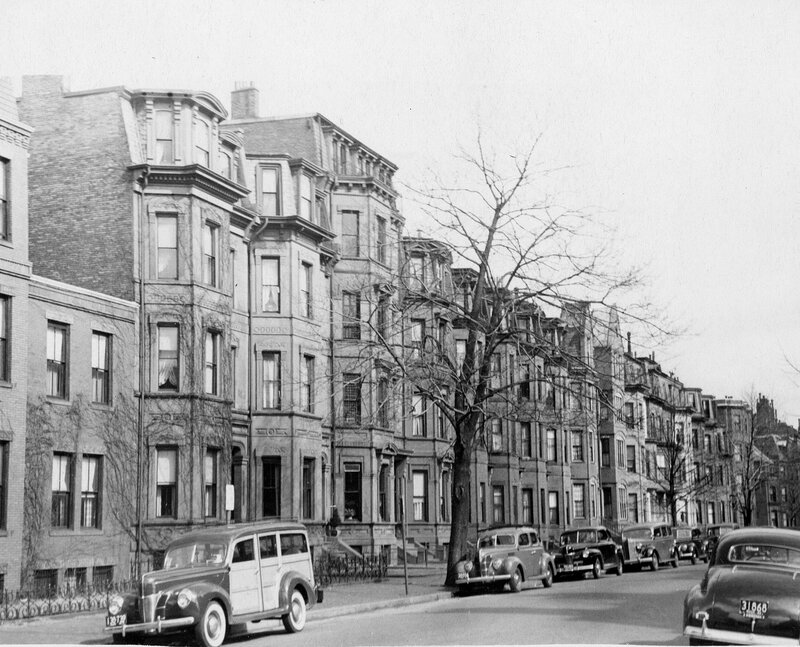 By the 1932-1933 winter season, 315 Marlborough was the home of Dr. Conrad Wesselhoeft, a homeopathic physician and expert on contagious diseases, and his wife, Frances Gordon (Kittredge) Wesselhoeft. They previously had lived in an apartment at 366 Commonwealth. They also maintained a home in Barnstable. T. Chittenden Hill died in April of 1936 and Marion Hill died in May of 1937. 315 Marlborough was inherited by Marion Hill’s two sons, H. Whitin Brewer and Cyrus Brewer, who continued to lease the house to the Wesselhoefts. On August 31, 1946, Cyrus Brewer acquired his brother’s interest in the house, and on October 15, 1948, he sold the property to Conrad and Frances Wesselhoeft. Conrad Wesselhoeft died in December of 1962. Frances Wesselhoeft moved from 315 Marlborough soon thereafter. On May 28, 1963, 315 Marlborough was purchased from Frances Wesselhoeft by Charles Forbes Sargent, Jr., and his wife, Louise (Green) Sargent. He was an electrical engineer. Louise Sargent died in October of 1983. Charles Sargent continued to live at 315 Marlborough. 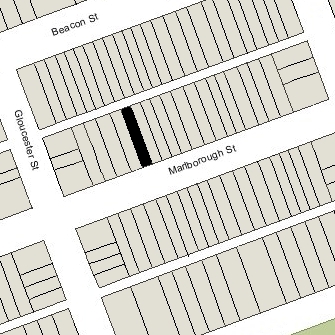 He married again to Sheila Ann Keigher, and after their marriage, they lived at 315 Marlborough. 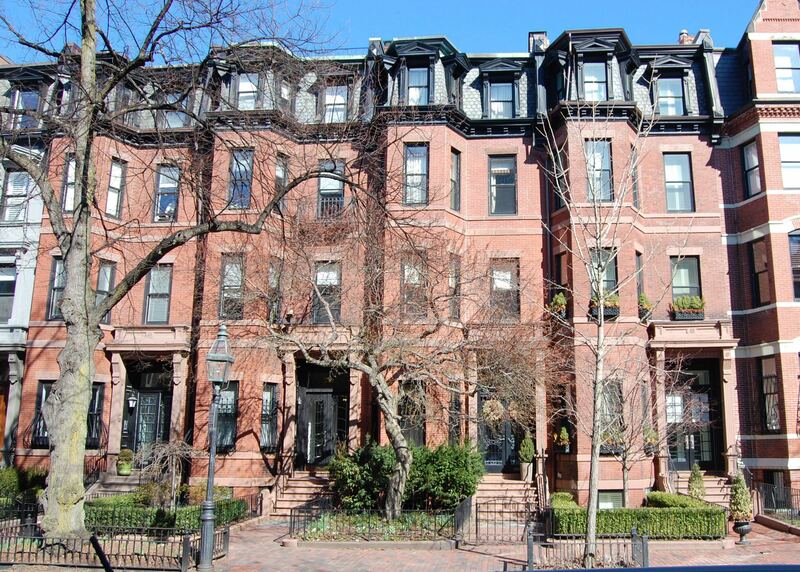 On June 16, 2004, he transferred the property to himself and his wife as trustees of the Marlborough Street Realty Trust. On December 27, 2012, 315 Marlborough was purchased from the Sargents by the 315 Marlborough Street LLC (Koby Kempel, manager of record).